A very moving occasion for all as the choir performed Stainer's Crucifixion with what would unfortunately be one of only two concerts with Ted. 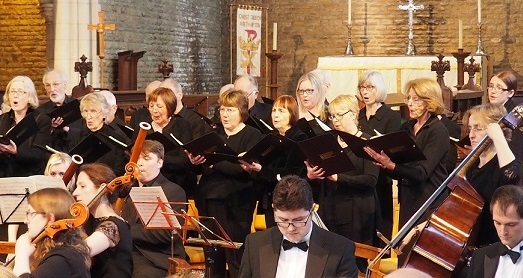 The choir had fortuitously planned a joint venture with the St Matthew's Church Choir for what was to turn out to be Stephen's last 'performance' in both his role as Music Director for the Chamber Choir and as Director of Music at St Matthew's. As a result this was a celebratory occasion, with Stephen's brother Tom Moore again providing excellent organ accompaniment to Stanford's Magnificat in C, along with a reprise of Philip Stopford's new piece 'O How Glorious!' as the anthem. It was lovely to hear from members of the clergy afterwards that they felt we had really 'blown away the cobwebs' with the scale and quality of sound we were able to produce as a result of our combined efforts. 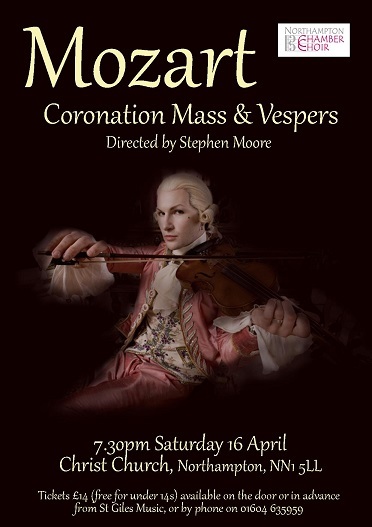 Two wonderful compositions by Mozart formed our Spring concert this year, and we were fortunate to be joined again by Anna and Nick Moodie, with Harry Bagnall and for the first time by Nicola Beckley (mezzo-soprano) as soloists. Anna in particular made a superb contribution given the number of soprano solos in these works. These were challenging pieces and the choir had worked hard on rehearsing them in the run up to the concert, but we found that our efforts paid off as this really contributed to our focus during the concert and our enjoyment of the music we were making together. It was also clear that this was appreciated by our audience, many of whom took the time to tell us that they had particularly enjoyed the evening, which was wonderful to hear. 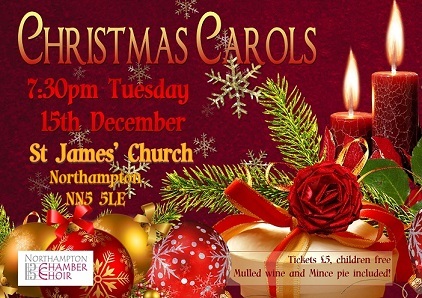 The choir once again enjoyed performing a short concert of carols and other seasonal pieces at St James' Church in Northampton. It was lovely to be welcomed by the Vicar and his congregation and celebrate the Christmas message with family and friends both old and new. As usual, everyone also particularly appreciated the warm mulled wine and mince pies whilst we socialised following the concert! 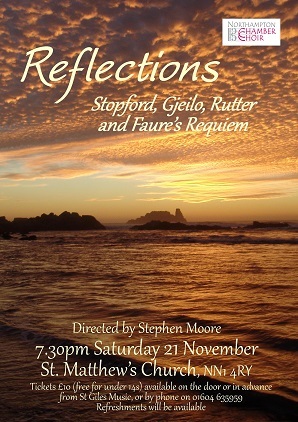 A concert which explores different reflections on living, moving from life and love (through a variety of pieces from living composers, including "This is the day", written for the wedding of HRH Prince William and Katherine) to its reflection in death via Faure's beautiful and ethereal Requiem. 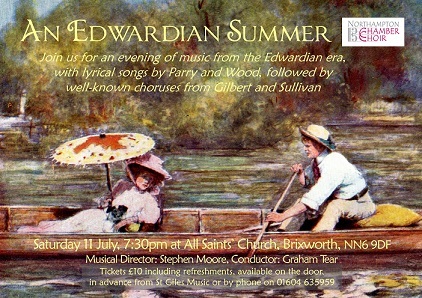 Music from the Edwardian era was the themem for this summer concert, which was intended to replicate the sort of summer evening which may well have been enjoyed by our forebears a hundred years earlier! We were joined by Graham Tear as guest conductor in this lovely parish church, although disappointingly there were some repairs being undertaken which meant that the church could not be fully appreciated. (Not to mention that the organ was out of commission as a result, leading to a hurried swap of solo from the organ to piano!) However, the weather stayed fine and the idyllic atmosphere was a fitting setting for Parry's Lyrical Songs which created a rather dreamy feeling which we quickly dispelled with some rousing Gilbert and Sullivan. A refreshing change of musical tempo and a lovely trip out of Nothampton, with the opportunity to pick up some new followers along the way. A collection of classical pieces was selected for this concert, with Schubert's glorious Mass in G as the core of the concert, accompanied by pieces by Haydn, Mendelssohn and Brahms. 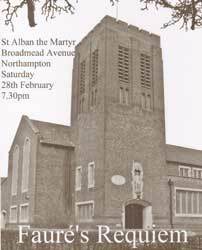 The choir was joined for the Mass and choruses from The Creation by the following soloists from Northamptonshire's Music & Performing Arts Trust, which the choir supports via its membership of the the Northamptonshire Music Education Hub. The choir also performed Mendelssohn's well known setting of "Hear my Prayer", with Deanna Linnell providing the soprano solo. We were ably supported throughout by Thomas Moore on the organ, and despite the unexpected early interval (whilst we persuaded the organ to stop playing a B), an enjoyable time was had by all. This was music which stayed with everyone for a long time after the concert was finished. 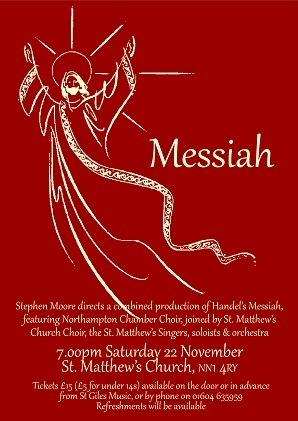 The choir was joined by the choristers and other members of St Matthew's Church Choir for this performance of Handel's Messiah. We were very pleased to have been able to perform a larger concert and provide an experience for the Church Choristers! Both audience and singers appeared to have thoroughly enjoyed the evening. 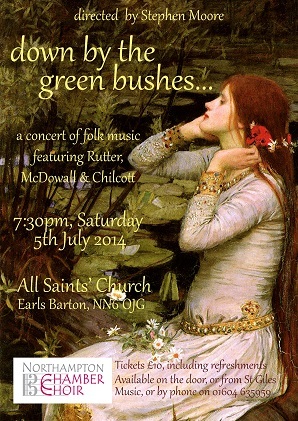 The choir very much enjoyed performing this lovely programme of folk music on a beautiful summer's evening in Earl's Barton. 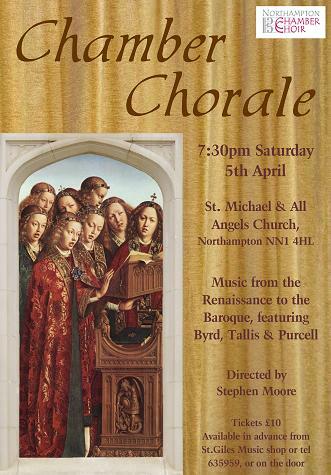 Saturday 5th April 2014: at the church of St Michael and All Angels, Northampton. 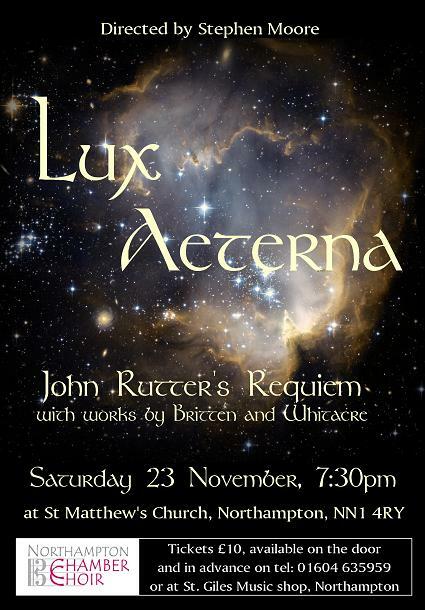 Returning to our roots as a Chamber Choir, this concert found us focusing on music purely from the Tudor and Jacobean eras. The Church of St Michael and All Angels proved an inspired choice in this regard, providing a beautifully intimate atmosphere surrounded by the rich colours of the church decorations. 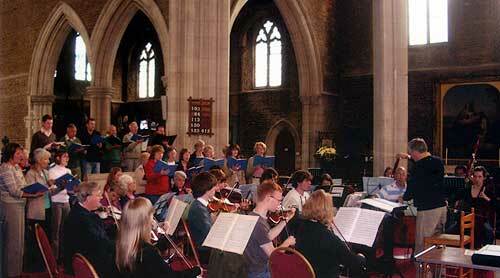 The performance included the Byrd Mass for four voices, and Purcell's Funeral Sentences for Queen Mary. The choir was extremely pleased to be joined for this last piece by some brass players from the Northamptonshire Music & Performing Arts Trust, which the choir supports via its membership of the the Northamptonshire Music Education Hub. It was wonderful to have these fantastic young players supporting us on the night. 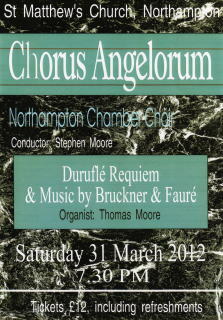 The evening went excellently well and over 150 people in the audience enjoyed the atmospheric performance of the Requiem. 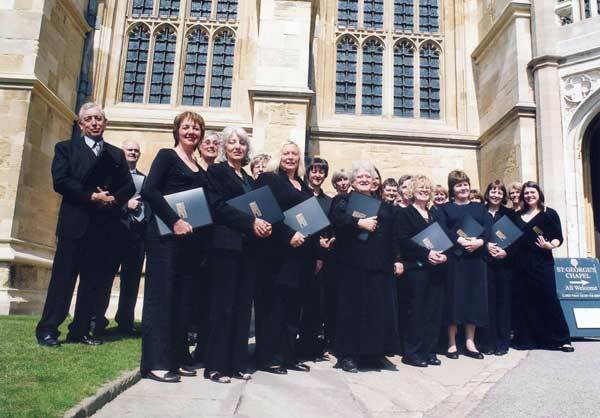 Northampton Chamber Choir descends on Wakefield! 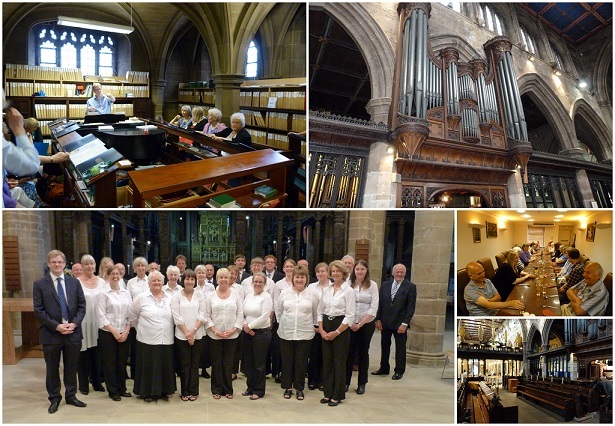 On the weekend of 20 - 21 July 2013 the choir packed its bags and headed to Wakefield to sing at the beautifully re-developed cathedral. Now with a significant amount of original wooden pews and decoration removed, the nave of the cathedral provides a much improved acoustic and the new stonework and chandeliers lend a touch of elegance to a cleaner and simpler space. The choir was invited to provide the music for both Sunday morning Communion and Evensong later in the day. 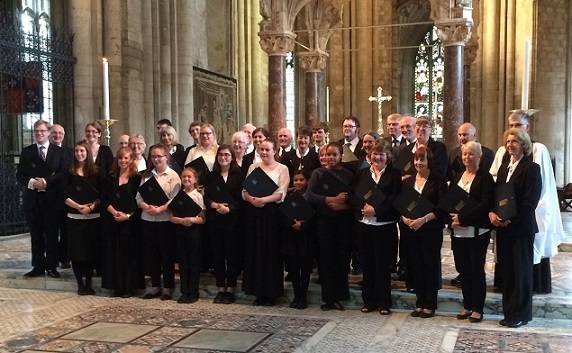 Both the choir and the cathedral were pleased with the quality of performance we were able to deliver, and the choir enjoyed re-familiarising itself with responses and psalms after a break from church services over the last few years. 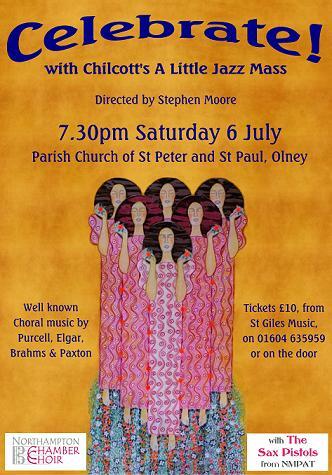 Chilcott's A Little Jazz Mass, along with well known music by Purcell, Elgar and Brahms. 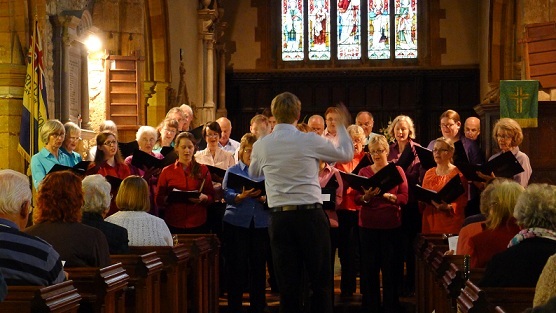 The choir broadened its horizons a little this summer both musically and in terms of concert location with the choice of A Little Jazz Mass at Olney. Considering the beautiful weather we had a good turn out and plenty of people who had not heard the choir perform before. Unfortunately, The Sax Pistols were unable to join us at the last minute due to unforseen circumstances but Mark Pescott ably assisted on the organ along with Ben Druet on clarinet. Both also provided excellent solo pieces - Mark's played purely with his feet! The jazz went fantastically well and was enjoyed by the audience, with complement of shorter secular pieces making up the remainder of the programme. All in all, a great summer evening out. 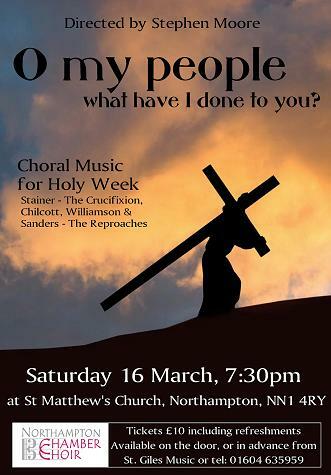 Stainer's 'The Crucifixion', Williamson's 'Procession of Palms' and 'The Reproaches' by John Sanders. The first half of the programme consisted of several shorter pieces, including the rarely performed Procession of Palms by Williamson, and Sanders' beautiful and haunting Reproaches. Many thanks go to Tom Moore who came down from Wakefield again to provide excellent accompaniment throughout. 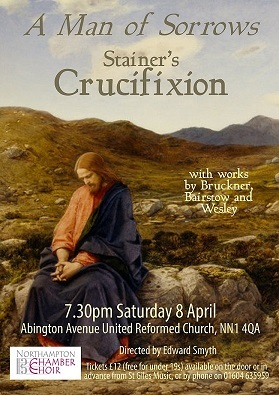 This set the tone wonderfully for the second half performance of Stainer's 'The Crucifixion'. The choir was joined by Tenor Stephen George and Bass James Wallace who gave us superb solo performances. The atmosphere in St. Matthew's was intense and several of the audience commented that the choir's singing had a great depth of emotion. I know that we all really enjoyed bringing this well loved piece to life. This concert was a well-received musical journey from St.Cecila's day through All Souls and All Saints days and onto Advent. The choir particularly enjoyed singing Samuel Sebastian Wesley's mini-oratorio "The Wilderness" with its several long solo sections, allowing us to feature soloists from the choir in all parts. 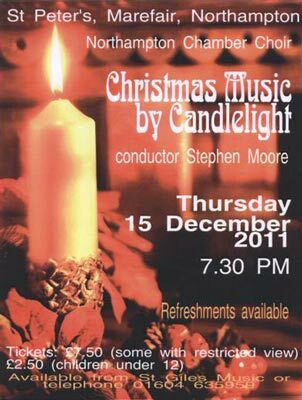 Thanks also to Mark Pescott who joined us as Organist for this concert and did a brilliant job, as always. Lighter summer music by Elgar, Rutter and others. Our summer concert this year was a relaxed affair, with the audience indulging in a glass (or two!) of wine whilst enjoying a mixture of well-known madrigals and folk songs. Stephen's choice of Elgar's "As Torrents In Summer" elicted a few wry smiles in one of the wettest summers on record, but luckily the evening of the concert remained fine. The late evening sunlight shining in through the church's beautiful stained glass windows added to a lovely summer atmosphere. 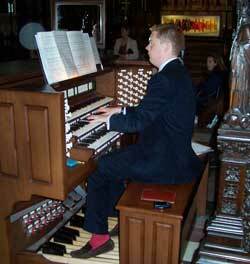 The choir was joined by Thomas Moore as organist for the Spring concert this year, at St Matthew’s Church. The first half of the concert contained a mixture of pieces from the Victorian era, including Fauré's Messe Basse for female voices only. Our Director, Stephen Moore also performed the Prélude from Suite Op.5 by Duruflé. 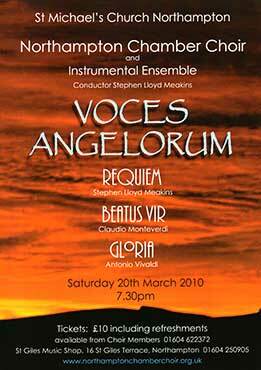 The second half was devoted to the Requiem, with excellent solos from James Wallace and Jennifer Dean. 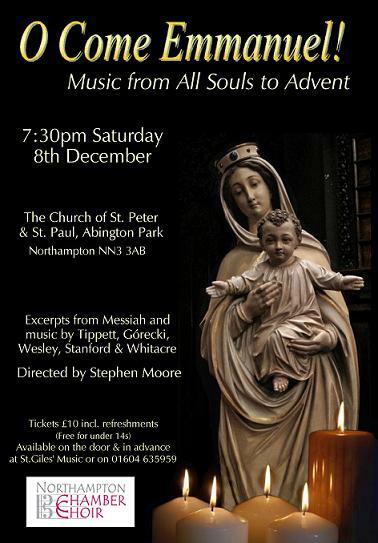 Our Christmas concert was held on Thursday December 15th, at St Peter’s Church, Marefair, Northampton, at 7.30pm. This was a festive occasion in an historic building, with the choir singing for the firs time under the direction of our new conductor, Stephen Moore. 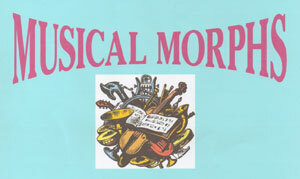 Saturday 14th March 2009 7:30pm "Musical Morphs"
A programme of choral arrangements of well loved music originally scored for orchestra, solo voice, pop group etc. 'The Armed Man'a Mass for Peace by Karl Jenkins proved to be a very popular concert for both the choir and the audience. 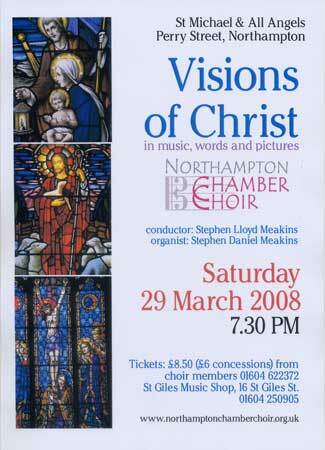 March 29th 2008 saw the choir present an unusual concert of music from each of the significant events in the life of Christ, illustrated with projected images of relevant scenes and expanded with occasional narrative. Musical Director Stephen Meakins comments: "Whether inspired by the Muses or touched by the hand of God many composers and artists have produced some of their best works when dealing with religious subjects. 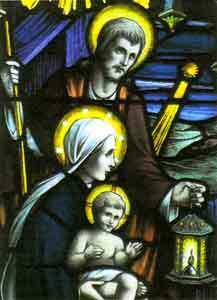 I conceived the idea of "Visions of Christ" being a multi-media experience with narrative, song and images. It is hoped that for a short time this presentation will lift the participant out of the daily stresses of modern life to engage in a brief journey of spirituality." 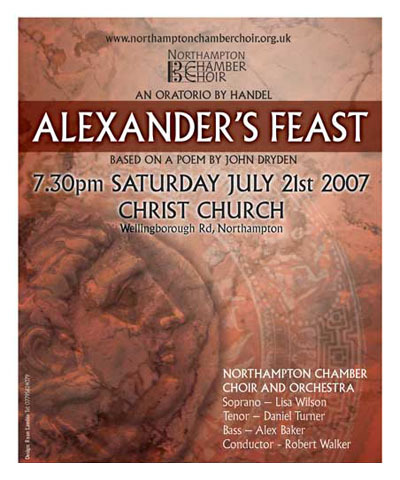 On Saturday 21st July 2007, the Northampton Chamber Choir and a chamber orchestra, assembled specially for the occasion from the finest musical talent in Northamptonshire, performed Handel's "Alexander's Feast" under the direction of Robert Walker, conductor and musical director of the choir. The featured soloists were soprano Charlotte Shipley, Nicholas Moodie and ex All Saints' Northampton tenor Daniel Turner, currently undertaking postgraduate singing studies at Guildhall School of Music and Drama. 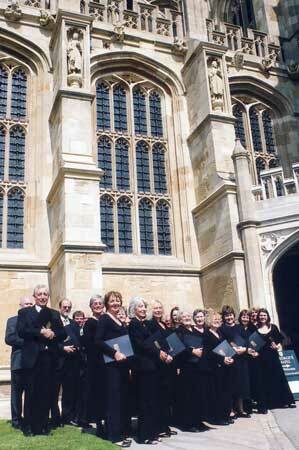 The Northampton Chamber Choir, under the direction of their conductor and musical director, Robert Walker, recently took the opportunity of showcasing Northamptonshire musical talent, when they were asked to perform at St. Georges Chapel, Windsor Castle. A challenging and varied selection of music for the Matins, Eucharist and Evensong services was performed by the choir over the weekend of Saturday 14th and Sunday 15th April to reflect the age of the royal chapel, from the 16th Century to the present day. 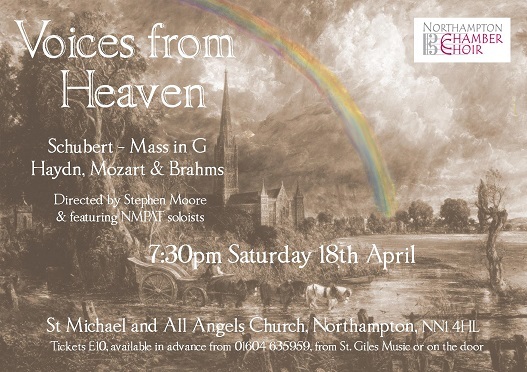 Robert Walker's own composition, "Te Deum" represented the present day, and the magnificent St.George's organ accompanied the choir, played by one of the finest young church organists, Northampton born and bred, Richard Pinell. 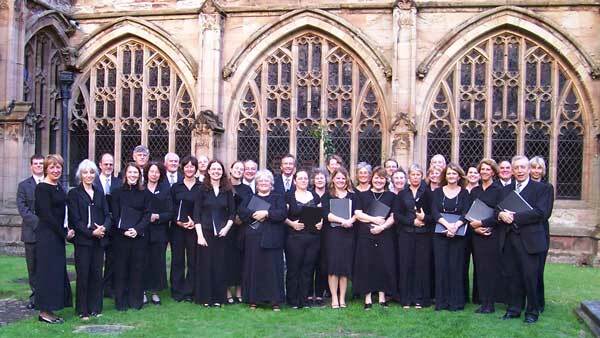 Saturday 2nd September 2006 saw the choir at Worcester Cathedral for Choral Evensong. This was the first evensong under Robert Walker's direction and the music included Robert's Magnificat and Nunc Dimittis 'The St. Paul's Service'. 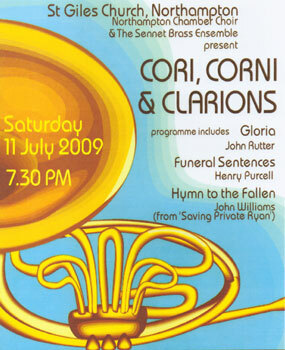 This work was commissioned by the Friends of St Paul's Cathedral and was first performed there early in 2006.